Welcome to Everything Mommyhood’s Tiny Love Giveaway! Tiny Love is an award-winning baby product company that was founded in 1991. They began branching out into developmental toys by focusing on creating toys and accessories to promote and maximize baby’s development from birth through 12 months. Today, their products are distributed in more than 50 countries worldwide! These seats are a life saver for a new mom! Both of my babies used to love their little rocker chairs. The Tiny Love chair looks like the best of everything! 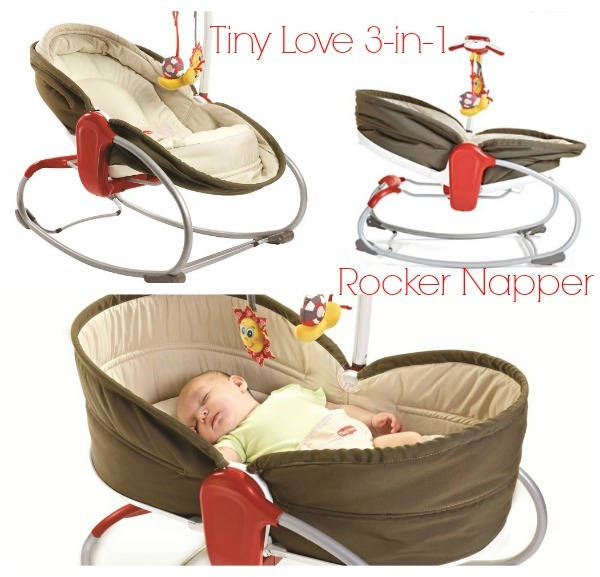 Tiny Love’s 3-in-1 Rocker Napper is an innovative product that goes from sit to sleep in just a few seconds. This Rocker Napper also offers soothing movements to rock your baby in all 3 positions, as well as a musical toy that hangs of the adjustable mobile arm. 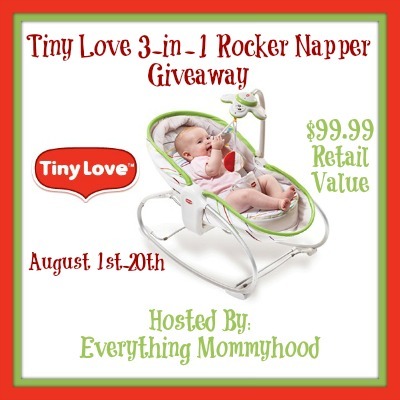 Check out Everything Mommyhood’s Tiny Love 3-in-1 Rocker Napper Review for more information. Now for the giveaway!Tiny Love is offering a chance for one lucky winner to win a 3-in-1 Rocker Napper in their choice of color, Red, Blue, or Flow Stripe, valued at $99.00! Must be a US Resident, 18 and up All Winning Entries Will Be Verified Winner will be contacted via email and will have 48 hours to claim their prize before a new winner is chosen. Giveaway begins 8/1/2013 at 1am CST and ends 8/20/2013 at 11:59pm CST Good Luck! Disclosure: This blog was not compensated for the posting of this giveaway. Tiny Love is responsible for the shipment of the above aforementioned prize. Our opinions are 100% our own and may differ from those of your own. Facebook, Twitter, Pinterest, and any other social media are not affiliated with this giveaway. If you have any questions please contact the host of this giveaway at EverythingMommyhood@gmail.com. Where do i live book is cute! http://store.tinylove.com/take-along-bouncer-red is great for the family on the go…and with lil ones you go go go all the time. I would also like to try the Gymini® Tiny Princess™ Move & Play because I need a new play mat for this new baby due later this year.